Ealing Christmas Market — Eat Me Drink Me | Food, drink and event experts in West London and beyond. The Ealing Christmas Market returns to Ealing Broadway Centre for its second year on Thursday 23rd November, bringing a unique selection of gifts to west London. A highlight of the market will once again be The Wonderland Collective – a beautifully decorated cabin featuring luxury and hand designed gifts, many of which you won’t find anywhere else in West London. Known for their design-led popups around London, the collective showcases artisans, makers & creative businesses from across the UK, with an emphasis on British made products. 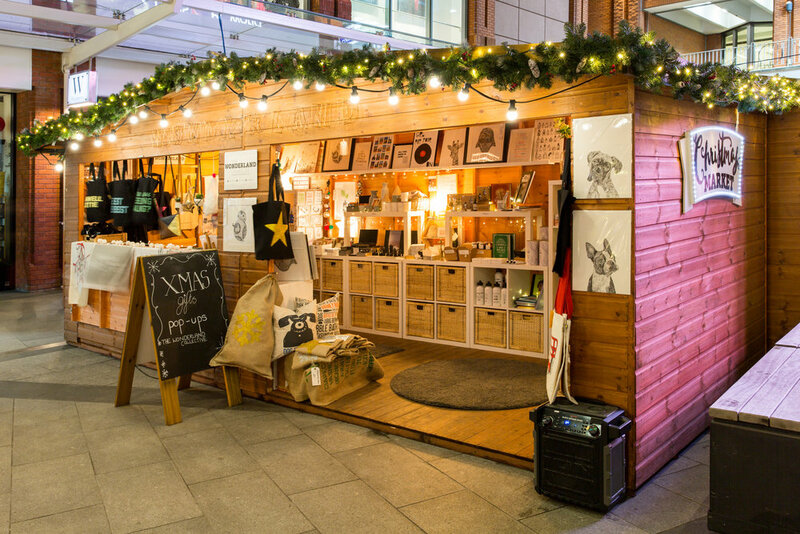 Alongside a selection of the more traditional Christmas stalls you expect at this time of year, there’ll also be a series of weekly popup boutiques from the likes of Wassail & Balter, Siyana, Mala & Bunga and Erskine Rose. Bespoke lighting installations from Chiswick’s Light Fixation will adorn the cabins and also available to purchase. Father Christmas will be on hand at the weekends and there’s an ice cave every day for the kids to enjoy. Hungry shoppers can stay replenished from a selection of street food stalls (and mulled wine) or rest their weary feet in the covered seating area before. It’s a familiar Christmas setting – with festive wood cabins, traditional decorations & twinkling lights – but a whole new shopping experience for West London. So don’t go for boring presents this Christmas – make yourself the most popular friend, brother, daughter, parent, or lover in town and head to Ealing for the ultimate Christmas gift ideas. Open daily from Thursday 23rd November to Sunday 24th December. ealingbroadwayshopping.co.uk for opening times & details of entertainment. Continent Clothing brings you the very best in street style and festival-wear created using vibrant and geometric traditional African Wax Print fabrics. Their aim is to provide full time and sustainable employment to as many people as possible in West Africa. They do this by working on a micro scale and working directly with local Gambian tailors, seamstresses and fabric merchants in Ghana, Senegal and Cote Du Voir. Anna is a designer & maker of hand bags using pre-1960s fabrics and vintage Liberty prints combined with hand-dyed canvas, dip dyed velvets, and Italian and up-cycled leathers. Making sure These 2 designer-makers will help make sure you’re gifting a one-off piece this Christmas - you will find them at the market from 11th – 17th December. Elsker Creations uses its combined love of art and food as well as traditional crafts to offer a variety of products, including gilded, personalised gifts and home goods - available from 1st – 10th December. French Designer Children's brand, with clothing, toys and small decorations. Created by a mother of two Tendre Deal selects not only the best designs, but it is socially conscious & high quality, all at affordable prices. Certainly something distinctive for your children this holiday season. Trading for one week from 23rd November. Mamacha will be joining us at the Ealing Christmas Market from 4th – 24th December with their gorgeously warm Alpaca jumpers, hats, gloves, socks and more, to help you stay cosy this Christmas. Mala & Bunga owner Raman always has her eyes peeled for new designers making exciting and accessible jewellery. Craftsmanship is key when choosing for the Mala & Bunga collection of independent jewellery brands like Ashiana, Anna & Nina, and Louise McLeod, resulting in well-made, gorgeous and interesting finds to grace the most stylish of jewellery wearers. They will be returning to the Christmas market from 18th – 24th Dec.
Siyana, named after a hamlet in the vibrant state of Rajasthan, India, is an ode to owner Megha’s ancestral village. Siyana also means protection, as Megha seeks to nurture the craftsmanship of India’s indigenous artisans while introducing contemporary ideas. The result is a fine work of wearable art -- handcrafted, hand-loomed accessories with a contemporary flair that gives Siyana London a distinct character. All products are made with natural material by artisans in rural parts of India. Lettie B Jewellery Lettie is a silversmith who creates lovely individual handmade items as well as an extensive collection of affordable silver jewellery. Lettie B is a favourite of the Ealing Christmas market, and she will be back this year for the entire run. A range of jewellery inspired by designer Yvette’s upbringing in South Africa – all the leather and stones used are sourced from small family run businesses in the country. Jewellery designer Anita Dickinson creates beautifully unusual pieces using sterling silver, genuine gemstones and real pearls. All items are handmade and one of a kind. Making sure you’re gifting a one-off piece this Christmas - you will find them at the market from 11th – 17th December. Light Fixation hand-make their own range of high quality, fun and individual light fittings, with the option to purchase LED filament lamps with them. Hailing from Chiswick, this husband & wife team design and hand-make their own light fittings – turning galvanised conduit and regular household items. Their lighting will be on display in 3 of our cabins this year, including the Wonderland Collective, where it is also available to purchase. Their passion for high quality, locally sourced and ethically produced Indian street food shines through their authentic, family inspired menu. Expect traditional dishes such as simosas, onion bhajis, tandori chicken and more. We recommend their masala chips as a naughty treat. Selling a vast array of quality traditional sweets, delicious hand made fudge and imported gourmet liquorice. This family run business serves up a selection of authentic German sausages including bratwurst, currywurst and krackuer. You can also find a variety of delicious butchers sausages, bacon baguettes and pomme frites. Perfect for the colder months.